What Price Should You Charge Your Customers? Developing your company's pricing strategies takes trial and error no matter which industry you are working in. If you're operating a for-profit business, then you need to earn more than your costs at a bare minimum. Otherwise, you're giving your service away for free (and running a charity isn't what you intended when you became self-employed). Don't forget, most small businesses fail during their formative years which means you need to take extra precautions to make your company's financial health a top priority. you need to take extra precautions to make your company's financial health a top priority. TIP: Maintaining an accurate and up-to-date bookkeeping file is a step in the right direction. 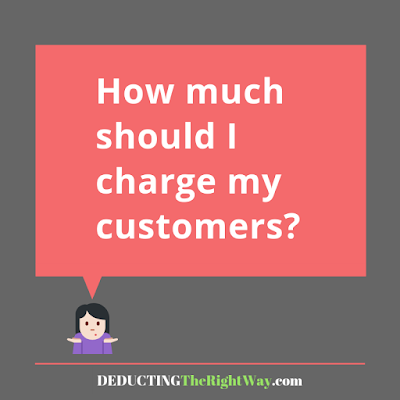 How much should I charge for my service or product? Small business owners make the mistake of slashing their prices to bring in new customers. However, this marketing strategy is more than likely to implode and requires you to work around the clock to make ends meet. Stand out from everyone else by altering the customer's perception and developing value not commonly offered to your customer base by other companies. It's okay to charge more if you include extra perks that are not currently available on the open market (e.g., free shipping, free accessory, free return, an additional visit, satisfaction guarantee). TIP: Striking the right balance can make or break a company so it may benefit you to consult with pricing professionals.